Gravity ripples across universe in waves! Einstein was right, again! Yesterday, 100 years later, scientists from Caltech, MIT and LIGO (Laser Interferometric Gravitational wave Observatory), announced in Washington that gravitational waves exist, predicted by Einstein in 1916, a century ago. It’s one of the most significant discoveries of the decade. 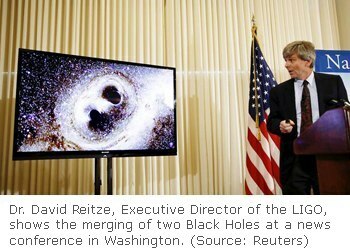 Scientists who believe the discovery opens new vistas into the ‘dark’ side of the Universe. Scientists said they detected gravitational waves coming from two Black Holes – infinitely dense objects whose existence was foreseen by Einstein – that orbited one another, spiraled inward and smashed together. They said that the waves which detected in LIGO were the product of a collision between two Black Holes 30 times as massive as sun and located 1.3 billion Light Years from Earth. These are waves produced by disturbances in the fabric of space and time due to movement of a massive object like a Black Hole. They would appear like ripples in a pond. The Laser Interferometer Gravitational wave Observatory (LIGO) is a large-scale physics experiment to detect gravitational waves. LIGO's mission is to directly observe gravitational waves of cosmic origin. These waves were first predicted by Einstein's General theory of Relativity in 1916, when the technology necessary for their detection did not yet exist. Their existence was indirectly confirmed when observations of the binary pulsar PSR 1913+16* in 1974 showed an orbital decay which matched Einstein's predictions of energy loss by gravitational radiation. The Nobel Prize in Physics 1993 was awarded to Russell Alan Hulse and Joseph Hooton Taylor for this discovery. *PSR B1913+16 (also known as PSR J1915+1606 and PSR 1913+16) is a pulsar (a radiating neutron star) which together with another neutron star is in orbit around a common center of mass, thus forming a binary star system. PSR 1913+16 was the first binary pulsar to be discovered. In 1974 it was discovered by Hulse and Taylor of the University of Massachusetts Amherst. Why is the discovery significant? Detection of these waves will give us a new picture of universe. We will be able to count Black Holes and Neutron stars, also weigh them, locate them and study their pasts. It could shed light on the Big Bang itself.